Brief Description of Subject: One in a set of three windows located on the East wall of Nave. 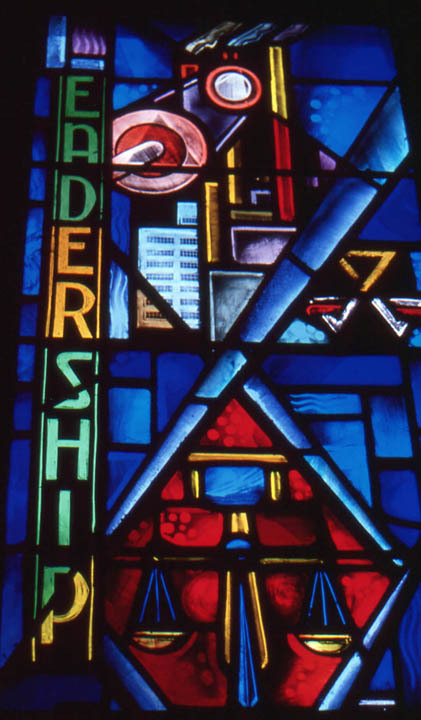 Leadership depicts many small symbols of industry, jurisprudence, and the arts. Most windows in the Alumni Memorial Chapel are sets of three on the same general topic with the same donor. This window is grouped with Freedom of Mind (L4a) and Diffusion of Knowledge (L4b). This image is a detail of the upper two thirds of the window. A full sized image needs to be acquired. The bottom of the window, which is excluded here, includes images of ballet slippers, a jester’s staff, a draftsmen’s triangle and an open book among other things. The artist appears to portray the artful balance and motion, good humor, technical skills and learning that are assets to a holistic approach to leadership. The portion of the window shown in the picture has scales depicting the balancing of these attributes to the benefit of industry and productivity. Leadership: The central emblem is the symbol of leadership of civic service, social service, and social work. At the top, in the background, is the building of the State Capitol to express leadership in the State. At the bottom, in the background, is the Civic Center and a street of homes to express leadership in the community. Designed by Anthony Mako.